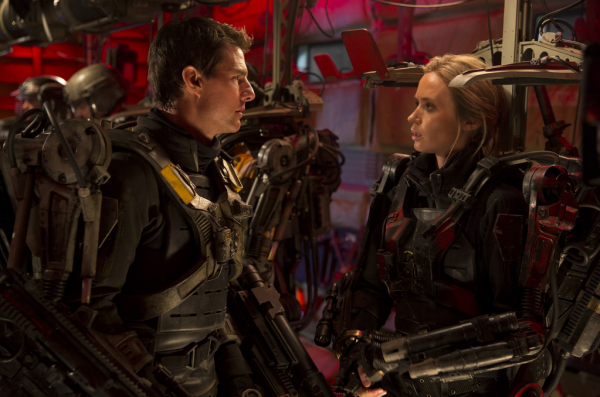 Warner Bros. has released a new image from director Doug Liman’s (The Bourne Identity) promising sci-fi actioner Edge of Tomorrow. The film stars Tom Cruise as a military officer who is killed within minutes of a doomed combat mission to take down a hive-like alien race. He wakes up and is forced to relive the day over and over again, but it allows him to become a better soldier and perhaps change his fate thanks to the help of a fellow officer played by Emily Blunt. The film’s first trailer put it squarely on my radar with it’s fascinating twist on a Groundhog Day-like premise, and this new image shows off the crazy mech suits that Cruise and Blunt’s characters wear. Hit the jump to check out the new image. The film also stars Bill Paxton, Laura Pulver, and Jeremy Piven. Edge of Tomorrow opens June 6th. Via Tom Cruise’s official Twitter.